Our extra long 10' Cotton D-Ring Yoga Strap is the best yoga strap for taller yogis or those who prefer extra length. Straps are used to grab toes, feet, and legs in harder balancing or reclined positions. Instead of struggling or bending to reach a limb, you can extend your arms length with a yoga belt, so correct alignment is not compromised and range of motion is slowly improved. At 1.5 inches wide, this strap prevents constricted circulation, yet is not too wide to easily hold and wrap around your hand. The metal D-Ring fastener is durable and makes quick adjustments easy. We carry this belt in shorter 6 foot or 8 foot lengths, or with cinch buckle, pinch buckle, or no closure at all. I like the classic D-ring strap over the ones that snap or buckle. These straps are strong, sturdy and extremely durable. I love the length - as a yoga therapist I use them everyday on clients of all shapes and sizes and these straps have yet to fail me! The D Ring strap is a good alternative to the snap buckle or plain strap. Though I prefer the plain 10' strap, some students like the convenience of the D ring. Good to have choices! I was a little worried when I unrolled one because they are reallllly long. Longer than I've ever used. But I've found for full body stretches like a quad stretch on the belly, they are the perfect length for the ages and levels I teach. It enables EVERYONE to be able to grab and use the strap and I'd rather have that than it be too short. I have ordered items from Yoga Accessories before and have been happy with my purchases. The cotton yoga strap I purchased this time is perfect for my needs. It is sturdy, easily adjustable and uncomplicated. The fabric is high quality, and the purple color is soulful. I am happy. Thank you. These straps are sturdy and work exactly as I need. For some postures, students really benefit from using these long straps. I love the D-ring because it's so easy to adjust length as muscles release and the posture opens. Incredibly sturdy strap and great buy for the price. Wish the d-ring were a tad bigger to make sliding the strap easier and wish the strap were a little more pliable. But it works! I recently purchased 10' yoga straps for teaching. The quality of the straps far surpasses anything I could find locally. 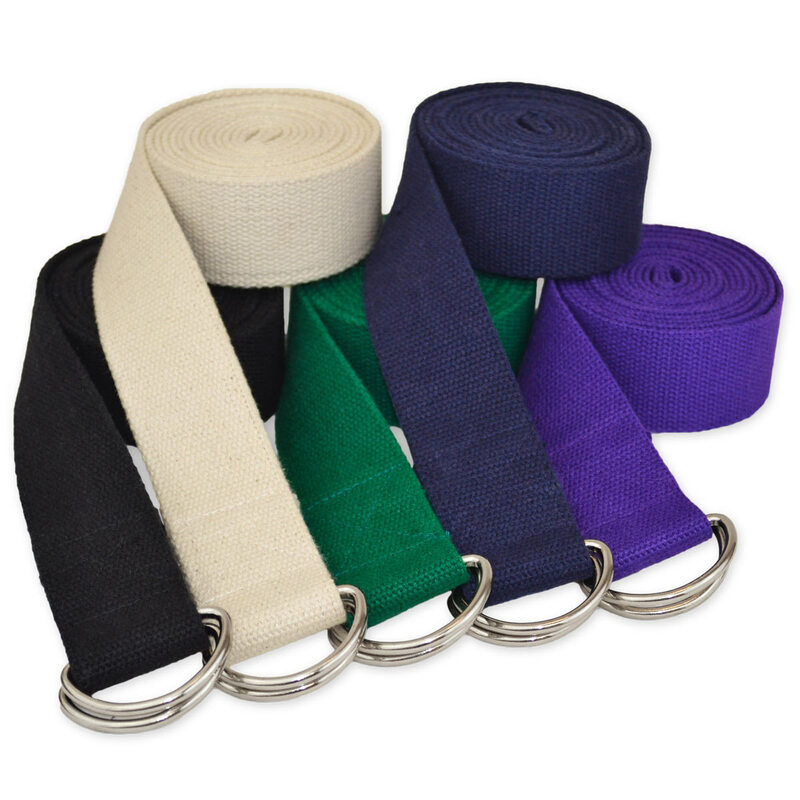 The length of these straps makes it possible for students of all sizes and levels of flexibility to access yoga poses. They are not the softest straps but they do the trick. I washed them with fabric softener and that helped a bit. But all in all I am happy with my purchase. I ordered 25 of these straps for my yoga students. They are nice and heavy duty, feel good during use and seem like they will last a long time! Will definitely order these again if I ever need more!